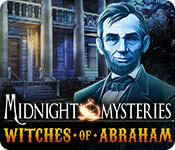 Midnight Mysteries: Witches of Abraham is rated 4.1 out of 5 by 31. Rated 5 out of 5 by denniann2 from started out slow but got better i really didn't like this game when it started but i got wrapped up in it after playing for a while. you are trying to solve the mystery of where all the gold went to when the KGC was formed. abraham lincoln's ghost is helping you as well as a few other ghosts. it really is a good game. give it a chance. a sequel.....i figured as this is a long running series. Rated 5 out of 5 by SparkleGlow100 from I really enjoyed this story! 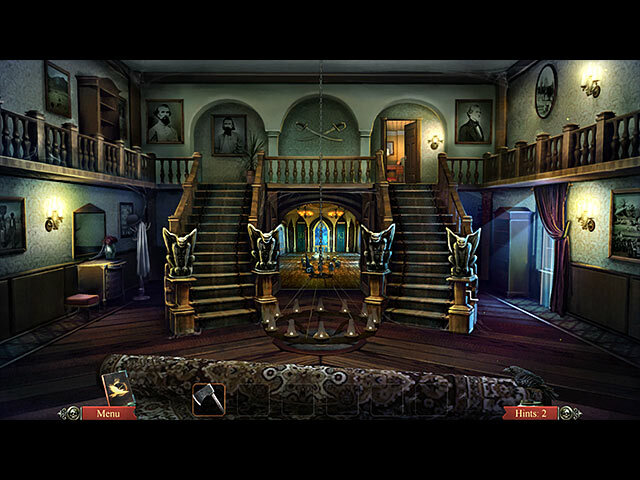 (Available at BFG since 2013 ) I found this game to be the best of the Midnight Mysteries so far! I was gripped by the main characters of Abraham Lincoln and Jesse James. The graphics were great - I liked the quality of them. The feel of the story is not comic book fantasy, but deeper and scarier in the sense of you can almost believe it. Well, that’s how I felt! GRAPHICS: Wide screen or full screen. SOUND: Only two: Music and Sound. HOPS: 12-15 Straightforward word lists with some hidden objects requiring further interaction. PUZZLES: 10 or so. Mixed ability. All skippable. DIFFICULTIES: 3 - Casual, Advanced, Expert HINT: Guides and leads you. There are no sparkles on Expert, but you still get a hint, even though it takes a while to charge 1-2mins. JOURNAL: Yes, to which you must refer occasionally for stored clues. MAP: Not required since the game is chaptered. But there is some sort of map. Never used it. INVENTORY: Was it lockable? Hmmm….. CHARACTERS: Really good voice-overs. Rated 5 out of 5 by BooksandGameFan from An Oldie but a goody! I absolutely loved this game!! I know it's an older game but it looks great and sound great and the hint recharged pretty darn quickly for an older game. If you love History as I do then I suggest you play this game. Lincoln looks very good and the voice they used for him sounds just like I imagine Abe himself sounded. There is of course poetic license used throughout but there is also real history included as well. Still one of my top favorite games! I highly recommend it! Rated 5 out of 5 by AdrianaIP from Great game with history lesson This series incorporates history quite well in the gameplay (Souther cause revisionists are going to hate this game, I am afraid). The challenges are fun, but not so tough that you lose the narrative thread. The visuals, and the HOS are very well in period, and the HOS objects are related to the theme and atmosphere. Learned quite a bit about the KGC and Jesse James and Frank Dalton. Great game. Rated 5 out of 5 by JustTheFacts from Love This Series, Love This Game BASED ON COMPLETED GAME FIRST IMPRESSIONS One of the issues about this game is how well the new developer manages to capture the essence of the other 4 Midnight Mysteries. I think they do a splendid job! Yes, the graphics are a little different, but I completely forgot about within a few minutes. The game starts out a little slow, but definitely different – Abraham Lincoln himself seeks your help to track down a secret society of witches and outlaws, including that famous bandit, Jesse James. SIGHTS & SOUNDS Uniquely styled graphics are again excellent, and still the only games like it. The mood is dark and so is much of the locations, but it is not uncomfortably so. I enjoy the portal travelling cut scenes. Another facet of the series. Love the beautiful music, as well as the signature Midnight Mysteries sound track. Ambient sounds and special effects are excellent as well. MAKING PROGRESS I feel this game has more puzzles than the earlier ones did, and some of them were quite tricky. Some required good coordination to complete, so I skipped. Skip is rather slow to kick in. The HOPs are very nice. They look beautiful and clear, indicated what kind of interaction is required to find a hidden object. As well as interactive lists, there is a multiple matching pairs and a misplaced items HOP. I like the way you can see the silhouette of an object by clicking on the name. Action and adventure gameplay is a little trickier too. But we get an interactive map this time. Another feature I love is the way the cursor works in interactions between inventory items and objects in the game. Our skeletal hand, normally white, turns blue when generally in the right place to click, then red if it’s the wrong tool, and sparkles like crazy when you hit the sweet spot. I wish more games had this feature to help reduce misclicks. BLING! Even though this is the Standard Edition of the game, you still get one of the blings! There are ravens to collect for hints. And, wouldn’t you know it? They’re tricky too! The one disappointment was the lack of clovers to collect and the replayable HOPs that the clovers unlock. They have been in SE games before with this series, but now you need to buy the CE if you want them. FINAL VERDICT Wonderful! I pulled an all-nighter to finish this game. And I loved every minute of it. I recommend this game! Rated 5 out of 5 by KeysPirate from Finally! A great game with real history! There are other great reviews of this very special game, so I will just list the things I liked most about it. HISTORY -- DATES, PEOPLE, PLACES. I actually stopped several times to go online and look up info. Never heard of the KGC, and never learned so much interesting stuff in any history class I ever took. Some is legend but much is verifiable. I think I had heard of J Frank Dalton but was surprised at what my research uncovered. GREAT GRAPHICS. The rooms were sort of dull, perhaps intentionally make to look old and dusty??? Loved the train and horses and the caverns. FUN PUZZLES. Not very hard but certainly not silly-stupid like so many are these days. Many required real math or logic, and many were unique and very clever. CLEAR, MEANINGFUL, INTERESTING HO SCENES. I don't much care for HOs; prefer finding things in "natural" locations, but these were very good. Often you even LEARN something from an object you find. Oh so much better than searching for tiny useless stuff that has no connection to the game. Objects were beautifully rendered. USEFUL AND BEAUTIFUL JOURNAL. Not really needed much since the game is not that difficult, but I enjoyed it and really liked that the options came up inside the journal. What a great idea! INTERESTING LOCALES. We get to visit real places and experience things the way they really were back around the 1860s. GOOD SOUND EFFECTS AND MUSIC. Not too much, just enough to enhance certain scenes. Often there is just silence, which seems appropriate. You can focus on the tasks at hand rather than being distracted by excessive or unnecessary music and sound effects. I liked the ravens, and managed to find 8 or so but never needed a hint. Should have tried it just to see what the raven would do. I suspect it was good. BOTTOM LINE: A very enjoyable, worthwhile game. I would love to see more games that let you learn something while you are having fun! Rated 5 out of 5 by aleta59 from Excellent-Completed Game Review The best so far, IMO, of this series. President Lincoln asks you to find the treasure hidden by the Kingdom of the Gold Circle, which really existed during the Confederate War. You are sent thru different portals and get to meet the infamous Jesse James and William Quantrill. Great graphics, voice overs and HO's. 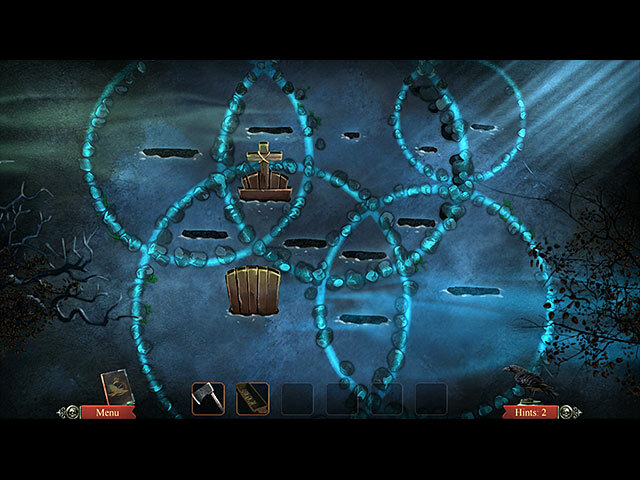 Good puzzles, and interesting locations to explore. Medium length 3.5 hours on casual. Rated 5 out of 5 by SuggaBabe from Witches and Abe Lincoln This game kept me on the edge of my seat. I loved it so I bought it. Rated 5 out of 5 by Fury161 from The Price Of Blood What a pleasure to find this series,one still interesting history,still beautiful and mysterious music,characters and voices are excellent,beautiful and smooth graphics,colors and atmosphere provide a lot of visual and sound together is a pure wonder.Three difficulty levels,widescreen,disabling voice,animated cursors ... a diary that included the main objective,a map that does not carry but the game is fairly linear,it is not a problem at all,it shows the places and areas of interest,the ravens are to recover for clues. 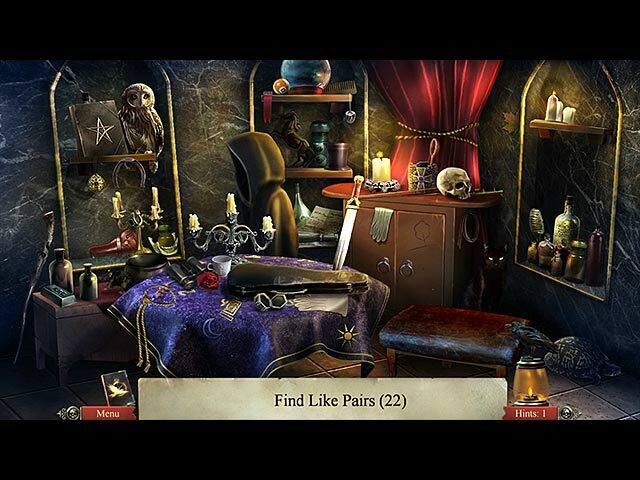 Few hidden object scenes,they are really fun to play,they have an excellent interactivity by clicking on an object in the list,its silhouette appears in the lantern,a final object is to take,there are also scenes with pairs of objects and people in place,they are all very well designed,very many mini- games and original creative design,they are more or less difficult and I had a lot of fun to make as they are very interesting. Many interesting information throughout the game,smooth navigation,a journey into the past always exciting when we explore places and very pretty scenery,actions to take,objects and a conclusive end ramasser.Une taking game for a minimum of " 3 Times 30 ",the collector is well with clovers in addition to collect a good bonus chapter and supplements relatively sympas.I think this developer very well assured over and made excellent work that honors the series,I will do it again with great pleasure and then there will be another part and already I 'm excited !